First, a little background. stickybits is another in a long line of social media apps such as twitter (Everyone’s thoughts! All the time!) and foursquare (Hey people, look where I am!) that actually has potential to be the next big thing in marketing. 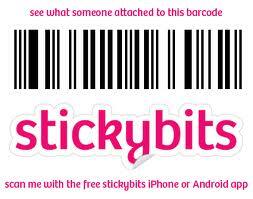 With stickybits, the user can scan the barcode of a product (whether it be a can of pop, an article of clothing, or even one’s own business card) and attach a personalized message, link to a video, enter a contest related to the product, or link to one’s resume or social profile on a website like LinkedIn. The possible uses of stickybits are endless both for consumers and producers. Call it a more versatile version of Sprouter, Twitter’s entrepreneurial big brother. So, what does this mean for the world of publishing? Well, as of last month, Harper Collins Canada has made a foray into the world of social media marketing in the form of an interactive contest using stickybits technology. They’ve asked consumers to discuss and comment on four of their titles using the stickybits app with the carrot being a variety of prizes for participation. (See this article in Quill and Quire for more detail on the contests) Call it a pilot project of sorts. However, as I see it, this could offer huge potential for authors and readers alike, notwithstanding the free advertising for publishers. Imagine being able to scan a barcode in a store and instantly have access to consumer book reviews, author Q & A’s, and maybe even video book trailers on your Ipod, Iphone or Android. Google’s on the move again. Not content with being the foremost search engine on the web, nor the foremost video provider (Hello? Youtube? ), nor a young schoolboy’s best way to spy on that cute girl next door, nor dominating the email market…now they’ve decided to challenge Amazon’s dominance in the market of ebooks. As of Monday December 6, 2010, Google has announced their plans to become the foremost provider of digital books in direct competition with Amazon.com. With access to over 3 million current and out of copyright titles, they’re set to make them available (for a price) in a customer’s personal e-library (much like Amazon) and easily read on any internet ready device, whether it be phone, computer or ipod. Surprisingly (? ), while their titles will be compatible with most ereaders…the Amazon Kindle is not one of them. So, what does this mean for your average eReader? More access to out of print books? More variety in how they view these tomes? More savings when choosing your next ebook? Amazon is not taking this lying down however, trying to block Google’s access to millions of out of print titles. Should be interesting to see what happens. But seriously, if you want to take a look at the new Google bookstore, here’s your chance. For further reading and an in depth story on developing Google/Amazon rivalry, Jefferson Graham’s article in USA Today is a must. Owen Zastava Pitt is just your average mild-mannered accountant working in the finance department of a small firm in downtown Dallas. Sure, he’s over 300 lbs of solid muscle and worked his way through school engaging in back street bloodsports, but still, he’s an accountant. An accountant with your stereotypically angry boss. Seems like nothing he does pleases Mr. Huffman, not even working late. However, when Huffman calls Pitt into his office one night, Owen expects another irrational dressing down, not a company dinner. Especially when Huffman has decided that the dinner is going to be Owen. You see, Huffman’s developed a case of Hypertrichosis as the result of an encounter on a recent camping trip, and as a side effect, developed a hunger for human flesh. However, Owen’s not about to send a memo to Human resources about Huffman’s behaviour, and thanks to Texas’ very liberal conceal and carry laws (and Owen’s very literal interpretation of the second amendment), he takes matters into his own hands in the form of a .357 Smith and Wesson. However, Huffman’s not having any of that, and owing to the fact that Owen generally doesn’t carry around silver bullets, things get a little hairy. Luckily, the law of gravity is on Owen’s side, and his former boss ends up a Lycanthropic splotch on the pavement after a 14 storey fall from a window office. Owen fares little better. Hey, let’s see you go ten rounds with a werewolf and see how you feel afterward. When Owen awakes from his injuries (five days later), he’s in the company of a couple of federal agents. Their role…to either put a silver bullet in his head in the event that his blood tests come back positive for lycanthropy, or in the event that Owen’s not going to go all Wolfman next time the moon is full…to threaten him into signing a nondisclosure agreement. After all, it is the official policy of the American government that supernatural creatures do not exist. The penalty? Prosecution to the fullest extent of the law under the Unearthly Forces Disclosure Act. However, shortly thereafter Owen is visited by Earl Harbinger, an associate with MHI (Monster Hunters International™), a for profit mercenary group along the lines of the infamous Blackwater. Monster Hunter International has its own private army, dedicated to pretty much what their company logo says…hunting monsters and making the world safe for your average person…at a price. Harbinger is both a founding member and head hunter of new talent, and he thinks Owen fits the bill. As for Owen, he’s not got much else going on. While still in the hospital he finds out that he’s been terminated from employment at the accounting firm (apparently he was in violation of their no weapons in the workplace rule) and shortly thereafter finds himself convalescing in his apartment and pondering his future employment prospects. Luckily for Owen, when next Harbinger visits, he brings along Julie Shackleford, a member of Monster Hunters International™’s founding family. She’s drop dead gorgeous, shares his fascination with all things ordinance (did I mention she’s gorgeous? ), and wants to offer Owen a job. Hunting monsters. For profit. She’s also brought along what could be termed his first pay cheque: $50 000 in government bounty for his first supernatural kill owed due to the P.U.F.F. act (Perpetual Unearthly Forces Fund) instituted by Theodore Roosevelt (something else you won’t read in the history books!). Needless to say, that makes his choice simple, and he decides to sign on. From there the action really takes off as the novel follows Owen’s training, integration into one of MHI’s hunting teams, and eventual first mission, which, if he doesn’t play his cards right, could be his last. Oh, and might result in THE END OF THE WORLD. But I’ve said too much. Read the rest for yourself. Monster Hunter International is written from Owen’s point of view, and the writing flows so that you get a great idea of his ideals and motivations. He’s got a sense of justice and honour that may not be mainstream, but he sticks by his guns (both literally and figuratively) in any situation and shows a strong, unswerving character. There’s no grey areas here. The bad guys are bad (really, really bad), the good guys are good (except when they work for the government), and when the two mix, the result is explosive. Monster Hunter International is not going to win any awards for high literature, but if you want a rip-roaring ride full of non stop action, violence and confrontations of the supernatural sort, it’s the book for you. 713 pages go by in a flash of silver bullets, Vampire Masters, Trailer Park elves, giant gargoyles, one extremely nasty conquistador, a prophecy that if fulfilled would open a doorway to another dimension and let loose the demons within…and young love. Reading this book I was reminded of John Steakley’s Vampire$ (a great book in its own right) and why not? They’re both about a group of mercenaries hunting down the supernatural both to keep humanity safe and for a crapload of money. So, if you like a dose of guns, girls and gore, Monster Hunter International has it. MHI was published in 2009, and in the meantime Larry Correia hasn’t rested on his laurels. The sequel, Monster Hunter Vendetta ,was released in paperback just this past September. Larry’s also a blogger, and if you’re interested in reading about his work (and thoughts) you can check in with him at Monster Hunter Nation and read about his work on the third novel, Monster Hunter Alpha.